As I mentioned earlier this week, I think CJSR is pretty cool and it’s something you should consider donating to. It’s time to kick things up a little though. That’s right. 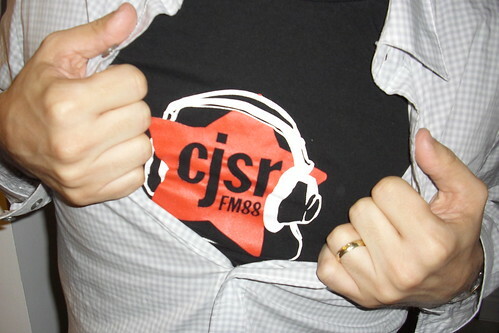 I will give you the shirt off my back* if you donate to CJSR. I think community radio is a valuable thing for us to support and sometimes you’ve just got to put your t-shirt where your blog is. Or something. 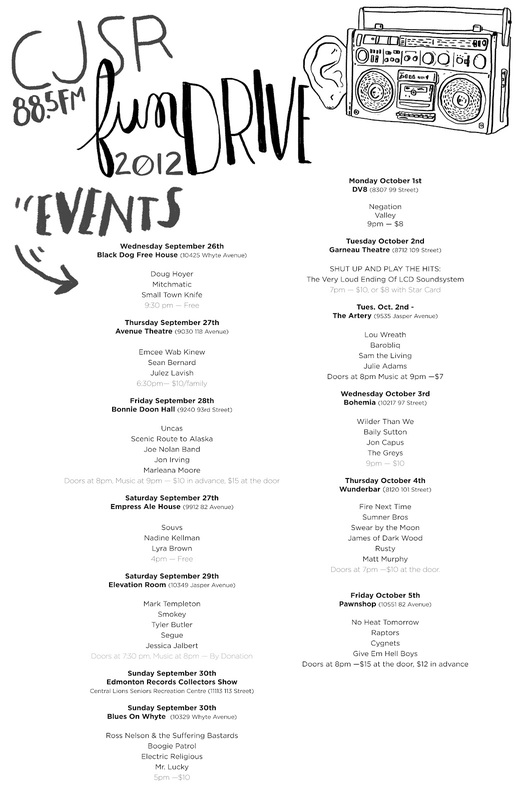 Oh, and if this somehow convinces multiple people to help out a great artistic hub of Edmonton, I shall draw names out of a hat to see which generous donor gets the t-shirt. Thanks, everybody! *It’s never going to be worn by me, so you don’t even have to worry about washing it, you can just go ahead and put it right on. This just keeps getting better for you. Community radio. Community music. Community arts. Community. I donated to CJSR, Edmonton’s community (and campus) radio station, this morning. It’s something you should consider if you’re a fan of Edmonton music, Alberta music, eclectic and independent music, international music, alternative and probing news, and supporting volunteers. I did it because I love Monday mornings with “Makin’ Whoopee“. Chad and Colin define what community radio is all about. They volunteer their time, they play music you won’t hear on any other radio station, including lots of local bands and artists, they support the other radio station volunteers, they keep us updated on the Asia Ice Hockey League, and they embrace the chance to tout the virtues of other volunteers, artists, and community-minded folks and efforts. Even if I couldn’t listen to anything else on the station (88.5 on your Edmonton FM dial, CJSR.com for all other occasions) I would give these guys money. Of course, there are plenty of other programs on CJSR I like listening to. All five days of the work week start with great shows, the weekend has plenty of international flavour, with members of so many of Edmonton’s vibrant communities (from the very newest immigrant nations to our city, to those who have made Edmonton home for some time) offering music from their home nations, their niche, and news and information on what’s happening locally with people sharing a culture. And if you’ve got an idea for a radio show, start volunteering today. Plus, CJSR is just one of those hubs you find in any city. The announcers support local artists, the artists reciprocate, and live shows happen all over Edmonton at friendly venues perpetuating the love. If you think about people and groups around Edmonton who are involved with art, music, and charity and community efforts you are not going to be very many steps removed from the little radio station in the basement of the U of A’s Students Union Building. 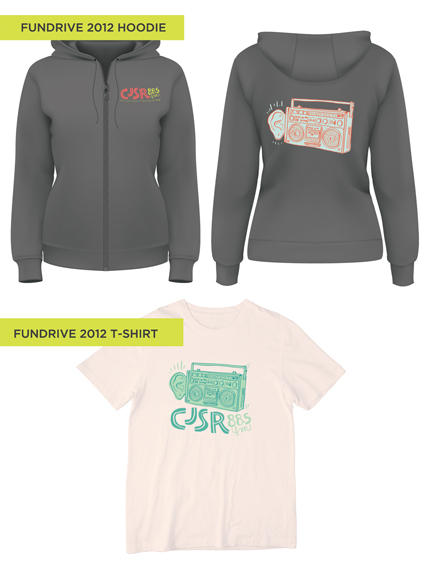 Oh, and if all that didn’t get you thinking about donating, there’s also sweet, sweet swag. Makin’ Whoopee is among the best, funniest radio shows/podcasts. The music is usually phenomenal too. If you are on Twitter you MUST follow Chad, Colin, and the show. Shows like Rock n’ Roll Must Be Destroyed, Calling All Blues, Terra Informa, BPM (with DJ David Stone), Heavy Metal Lunchbox, The Toast Marketing Board, The Ongoing Argument, Clockwork Orange Juice are basically aweseomsauce. It’s easy to donate online. Supporting independent campus and community radio is fun. You get free stuff for donating.